Dan Keough reads information about EMS honorees. 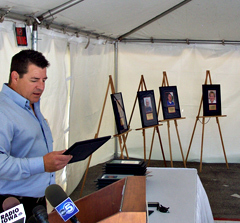 A ceremony Tuesday at a Des Moines hospital honored emergency medical service providers as part of “EMS Week.” Dan Keouh is the director of emergency transport services at Mercy Medical Center. Keough says the E-M-S job is not a 9-to-5 Monday through Friday job, it is a 24-7 job were people are always on call to take care of others. Keough says it is important to stop and recognize the men and women who provide the service. Keough says we should be very proud to honor the E-M-S members and be very proud of their service. Chaplain Jerry Barnhardt read the names of four E-M-S members who died in the last year. The names he read were Kenneth Van Lingingham Junior, Paul Hillers, Stephen James Nolan and Sheryl Stoolman. Stoolman died in an accident involving the Carroll County Ambulance crew. Keough talked more about her. He says in her 26 years at St. Anthony’s in Carroll she worked as an E-R nurse, E-R supervisor, trauma nursing education director, organ donation program coordinator, and assisted the ambulance service with quality assurance and skills maintenance. “She was very caring, very compassionate,” Keough said, “she dedicated her life to helping others. She had a passion for E-M-S and emergency nursing. She’d be an inspiration to all of those who knew her.” Sixteen other E-M-S providers were recognized for service above and beyond the call of duty during the ceremony. Read more about the award winners below.